where α and β are constants of microsecond values. The above equation represents a unidirectional wave which usually has a rapid rise to the peak value and slowly falls to zero value. The general waveshapes is given in Fig. 6.14. Standard Impulse Wave Shapes are specified by defining their rise of front time, fall or tail time to 50% peak value, and the value of the peak voltage. Thus 1.2/50 μs, 1000 kV wave represents an impulse voltage wave with a front time of 1.2 μs, fall time to 50% peak value of 50 μs, and a peak value of 1000 kV. When impulse waveshapes are recorded, the initial portion of the wave may not be clearly defined or sometimes may be missing. Moreover, due to disturbances it may contain superimposed oscillations in the rising portion. Hence, the front and tail times have to be redefined. Referring to the waveshape in Fig. 6.14, the peak value A is fixed and referred to as 100% value. The points corresponding to 10% and 90% of the peak values are located in the front portion (points C and D). The line joining these points is extended to cut the time axis at O1. O1 is taken as the virtual origin. 1.25 times the interval between times t1 and t2 corresponding to points C and D (projections on the time axis) is defined as the front time, i.e. 1.25 (O1t2 – O1t1). The point E is located on the wave tail corresponding to 50% of the peak value, and its projection on the time axis is t4. O1t4 is defined as the fall or tail time. In case the point C is not clear or missing from the waveshape record, the point corresponding to 30% peak value F is taken and its projection t′1 is located on time axis. The wavefront time in that case will be defined as 1.67 (O1t3 – O1t′1). The tolerances that can be allowed in the front and tail times are respectively ± 30% and ± 20%. Indian standard specifications define 1.2/50 μs wave to be the standard lightning impulse. The tolerance allowed in the peak value is ± 3%. 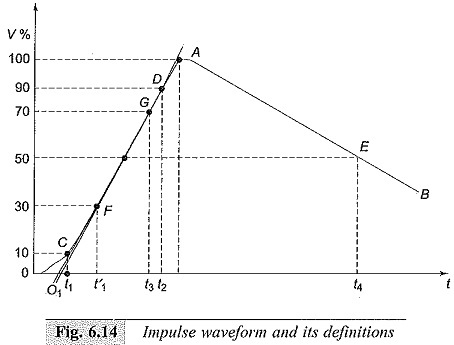 The Standard Impulse Wave Shapes are generally represented by Eq. (6.15) given earlier. V0 in the equation represents a factor that depends on the peak value. For impulse wave of 1.2/50 μs, α= – 0.0146,β = – 2.467, and V0 = 1.04 when time t is expressed in microseconds, α and β control the front and tail times of the wave respectively.